Bill Moyers is a broadcast journalist whose probing, thoughtful coverage reaches for the highest common denominator and assumes that viewing audiences will make the intellectual effort to meet him there. In doing so, he has spent decades enlightening Americans about themselves, their culture and the complex world around them. He anchors NOW on PBS, an hour-long weekly series offering fresh perspectives and analysis on today’s events, issues, and the ideas that are shaping the world. Called one of the 10 journalists who most significantly influenced television news by the National Academy of Television Arts and Sciences, Moyers has produced more than 240 programming hours since establishing Public Affairs Television in 1986. His documentaries range from the hard-hitting (Moyers on Addiction; Moyers on Dying in America; Facing the Truth, the story of the aftermath of apartheid in South Africa) and the marvelous (The Power of Myth; Amazing Grace; Healing and the Mind) to the historical and political (God and Politics; The Constitution in Crisis; Minimum Wages). Moyers combines a quick wit with deep reflection on the human condition. His 25-year career in broadcast journalism has been recognized with many major awards, including over 30 Emmys; the Erik Barnouw Award from the Organization of American Historians; the George Foster Peabody Award for political reporting and international coverage; and the Gold Baton, the highest honor of the Alfred I. duPont/Columbia University Award. Five of the books based on his television series, among them the 1971work Listening to America have become bestsellers. Moyers began his journalism career at age 16 as a cub reporter on the Marshall News Messenger. He earned his B.A. in journalism with honors from the University of Texas at Austin in 1956, and three years later received his Bachelor of Divinity degree from Southwestern Baptist Theological Seminary at Fort Worth, Texas. After serving as deputy director of the Peace Corps during the Kennedy Administration, he became the press secretary for former President Lyndon B. Johnson. As the first presidential spokesperson to make the transition to journalist, he has a unique perspective on the forces effecting news coverage. 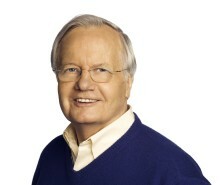 Moyers left the White House in 1967 to become publisher of Newsday, served as editor-in-chief of Bill Moyers’ Journal an award-winning program on public television, from 1970-76, and then moved on to CBS. He has also served as president of The Florence and John Schumann Foundation, and was a trustee of the Rockefeller Foundation for 12 years. Do you want to hire Bill Moyers? Directly request a quote. In 48 hours we can send you the availability of Bill Moyers If you would like to book Bill Moyers, Entertainment Booking Agency is the right place. We will offer you the best price and contact the management or we directly contact Bill Moyers. For corporate appearances or speaking engagements you can contact our agents and the will help you true the process. Tags: hire Bill Moyers, Bill Moyers booking, book Bill Moyers, Bill Moyers appearances, find more information on booking Bill Moyers for appearances, Bill Moyers speaking engagements, Bill Moyers endorsements/spokesperson, Bill Moyers appearance fees, Bill Moyers booking agency contact info, biography of Bill Moyers, Contact an artist booking talent agent find a speakers bureau that can book Bill Moyers, speaker booking agency for Bill Moyers, Bill Moyers booking agency, Bill Moyers booking for corporate event. EBA is one of the biggest entertainment booking agencies in the World. We book hundreds of celebrities, artist, athletes and speakers in a year. Important to know is that we are not claiming to be the management of Bill Moyers. We are not the official agent for Bill Moyers. Companies from around the globe book these artists and speakers true our company be course we have one of the biggest networks and we always have direct contact with the artist or the management. We help you to find the right celebrities for your corporate of private events. Please contact one of our agents to get free advice and we will help to get the world-famous artist on your party.